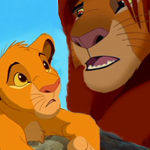 my lion guard fan fic "Kions start"
Re: my lion guard fan fic "Kions start"
new chapter again! sit back and enjoy! it was a rainy day at the pridelands and all animals take shelter around priderock and trees abiding. the lion guars lair is full of prideland visitors sheltering from the bad weather. boredom strikes among the animals and some are getting irritated. what a nasty weather, there is nothing we can do! a zebra scatters. it is very boring, this rain prevents us from relaxation, a monkey shouts in distress. come on guys, cheer up!! kion screams in agony. it is only some bad weather. we are sheltered and dry. we just need to entertain ourselves while we are here. good idea kion! rafiki shouts. good luck with that, fuli nods. beshte is not in the cave. he is a hippo, he is used towards fluid weathers. he is in the water outside. ono sleeps in the trees, dry in the branches. and bunga is outside with timon and pumbaa who happen to have low hygienical standards. fuli and kion meet at the entrance of the lion guard lair. kion, what is your plan with all our sheltering visitors? a singing contest! kion explains his ideas. wow! fuli shouts after hearing about this singing contest. that is genious! the contest is announced and the animals in the lair say yes. zebra, come here and sing. the zebra performs and everyone is entertained. next is the monkey. he makes jokes and ends with a funny song. then the elephant makes jazz with his facial slur and it ands with the birds who do a choir performance in b minor. yay! the animals are happy and the singing contest is won by the elephant. all go outside and play into the sun. thanks kion! bye fuli! they thank both for the shelter. you are all welcome! and that was another adventure.